The summit is being held at RAF, Brize Norton, UK. Prime-Minister David Cameron has been hosting French President Francois Hollande and their aim is to discuss primarily the relationship between the UK and France on issues such as security, reform of the EU, nuclear energy, defence & space collaboration and how to make the EU more competitive. The air base of RAF Brize Norton provided many photo opportunities with defence planes as a backdrop. The PM’s were accompanied by Secretaries and Ministers, such as the Foreign Secretary, Defence Secretary, Energy Secretary and Minister for Science, both the UK and French counterparts made their announcements, of which included many UK-French collaborations, which the No10 have referred to as a further strengthening of co-operation between the two countries. 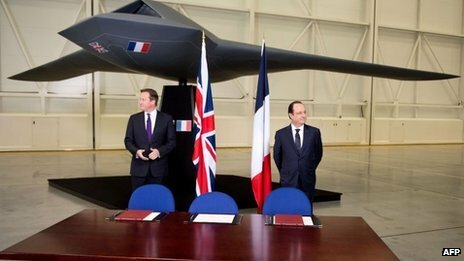 The outcome of the Summit saw announcements on the UK and France signing a declaration on nuclear energy and agree cooperation on ambitious climate change action, and the two countries agreeing to closer defence co-operation and a £15 million investment which will see a space collaboration between the UK and France. The EU reforms discussion was the most difficult for the two to work together on, with PM Hollande saying the amendments to the EU reform are “not urgent”. 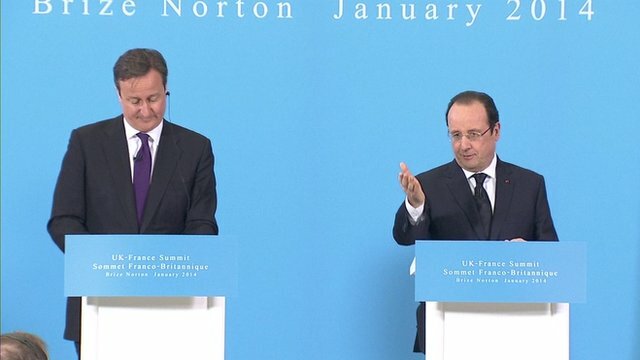 David Cameron faced the issue of trying to negotiate on the UK’s membership with the EU before a referendum in 2017, President Hollande did not seem to be wanting to rush anything and saying that a treaty change was “not necessary”, although President Hollande did say in the future there could be a reform if it helped with the EU to be “better co-ordinated”. Prime-minister David Cameron will be able to go ahead with a UK vote on the issue of an in-out EU referendum, if he is re-elected in the 2015 general election, which would see the UK vote take place on the EU referendum in 2017. The French and the UK also looked at the important issue of the Central African Republic, Libya and Syria, and the issue of radicalisation of French and British citizens, fighting abroad. It was of course President Hollande who intervened with french troops in the Central African republic and the UK have said they will assist in these operations to counter these militants. Although the two men managed to make some movement on the discussions and agreements, there will be much more to do in making these agreements work and especially on the UK – EU relationship.